Associate Professor Tulgar TOROS was born in 1969 in Izmir. 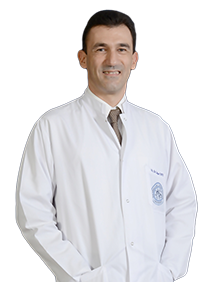 TOROS, is working in the fields of shoulder, elbow, foot and ankle surgeries besides Orthopedics, Traumatology and Hand Surgery specialties. He has been working at EMOT Hospital since 2002. He speaks English.He is married to Chest Diseases Specialist TOROS. Commentary on Zyluk et al. No correlation between sonographic and electrophysiological parameters in carpal tunnel syndrome; and Yalcin et al. Ultrasound diagnosis of ulnar neuropathy: comparison of symptomatic and asymtomatic nerve thickness. J Hand Surg Eur Vol. 2014 Feb;39(2):172-4. J Hand Surg Eur Vol. 2012 May;37(4):329-35. Acta Orthop Traumatol Turc. 2011;45(3):175-84. Acta Orthop Traumatol Turc. 2010;44(6):452-7. J Hand Surg Eur Vol. 2011 May;36(4):320-4. Acta Orthop Traumatol Turc. 2009 Aug-Oct;43(4):309-16. [Long-term results of major upper extremity replantations]. Sugun TS, Ozaksar K, Ada S, Kul F, Ozerkan F, Kaplan I, Ademohlu Y, Kayalar M, Bal E, Toros T, Bora A. Acta Orthop Traumatol Turc. 2009 May-Jul;43(3):206-13. J Hand Surg Eur Vol. 2010 Feb;35(2):125-9. J Bone Joint Surg Br. 2009 Jun;91(6):762-5. [The importance of patient selection for the treatment of proximal humerus fractures with percutaneous technique]. Eur J Radiol. 2010 Feb;73(2):234-40. [Comparison between two mini incision techniques utilized in carpal tunnel release]. Acta Orthop Traumatol Turc. 2008 Aug-Oct;42(4):234-7. Arch Orthop Trauma Surg. 2008 Oct;128(10):1055-63. Ultrasonographic evaluation in plantar fasciitis. Karabay N, Toros T, Hurel C.
J Foot Ankle Surg. 2007 Nov-Dec;46(6):442-6. [Isolated severance of the intrinsic motor branch of the ulnar nerve caused by stab injuries to the hand: A report of three cases]. Ozaksar K, Toros T, Kayalar M, Ademoğlu Y.
Acta Orthop Traumatol Turc. 2007;41(3):249-52. [The importance of finger extension test in the diagnosis of occult wrist ganglion]. Acta Orthop Traumatol Turc. 2007;41(1):42-7. [The frequency of vascular variations and complications with the use of the posterior interosseous artery flap]. Acta Orthop Traumatol Turc. 2006;40(4):307-10. J Hand Surg Br. 2006 Oct;31(5):574-5. Chronic synovitis caused by a date palm thorn: An unusual clinical picture. Congenital deficiency of the tibia: a report of 22 cases. J Pediatr Orthop B. 2001 Apr;10(2):161-3.